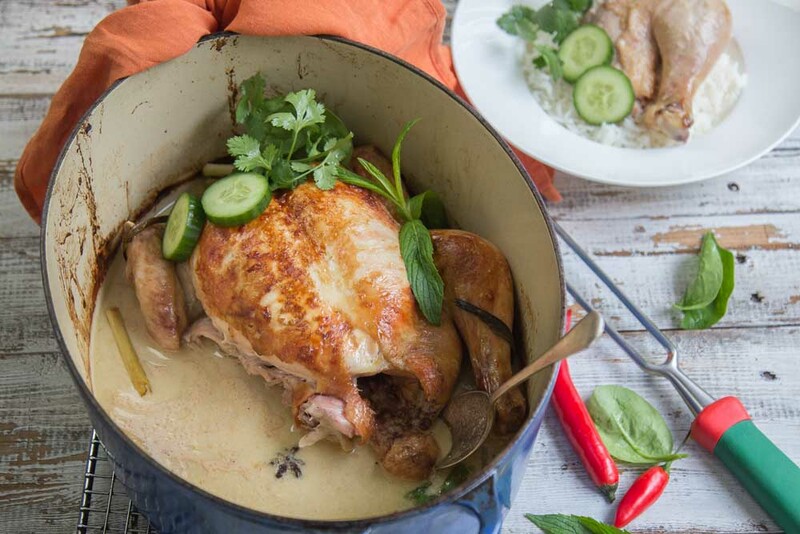 One pot would be attractive enough when dinner time comes around …but this is One Pot Coconut Roast Chicken. That is even better. I made this after getting home at 5.30 the other day. I had people coming for dinner at 6.30 pm and it was a lifesaver. The nice thing is they said they could smell it from outside the house and hoped it was on their menu for dinner. Luckily it was. It might be just me but everything seems to happen at the last minute for me these days. Thats not to say I am totally disorganised but I only seem to scrape in at the last second. I’m a bit like a baseball player reaching the safety of home base. So with that vision in mind imagine me shoving this chicken into the oven then running around the house to clean up. Sound familiar to you? 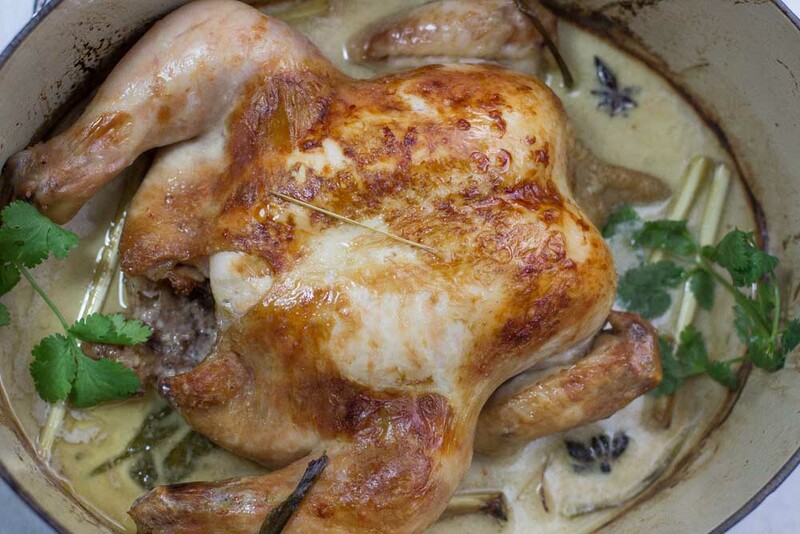 Chicken is a bit of a staple at my house because it is quick and bloody easy to gussy up. Throw some garlic and ginger at it and you almost have a success without even trying. The only downfall is that it can overcook and that is where this recipe will become a favourite. It’s packed to the rafters with flavour and it cooks in its own juicy sauce. This recipe needs no turning basting or any of your valuable attention really. Just have that glass of wine and don’t forget you have rice boiling on the stove. That is all. When there is only one or two of you it will provide days of easy street lunches for the week ahead. 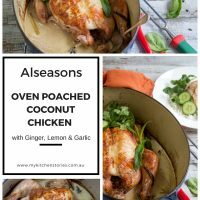 It’s pretty much like the old Jamie Oliver chicken cooked in milk but better because it is cooked in coconut milk and you can add all those flavours that make south east Asian food so moreish. Whether it is hot or cold at your place you can make this to suit the conditions. I did mine in the oven but there is nothing stopping you roasting yours on the BBQ and serving it with salad. It’s gloriously satiny and sings to the flavour of star anise and ginger. Just suppose though that you don’t have star anise or cassia. That would be a shame, because they are so good but it just shouldn’t stop you making it. Put a t/4 teaspoon of ground cinnamon in instead of the cassia. Don’t have Star Anise in your town? Just add 4 fennel seeds instead. Just saying nothing should stop you here. It’s all about what you like so go for your own favourite combo. What about some curry paste or powder, lemongrass or turmeric? 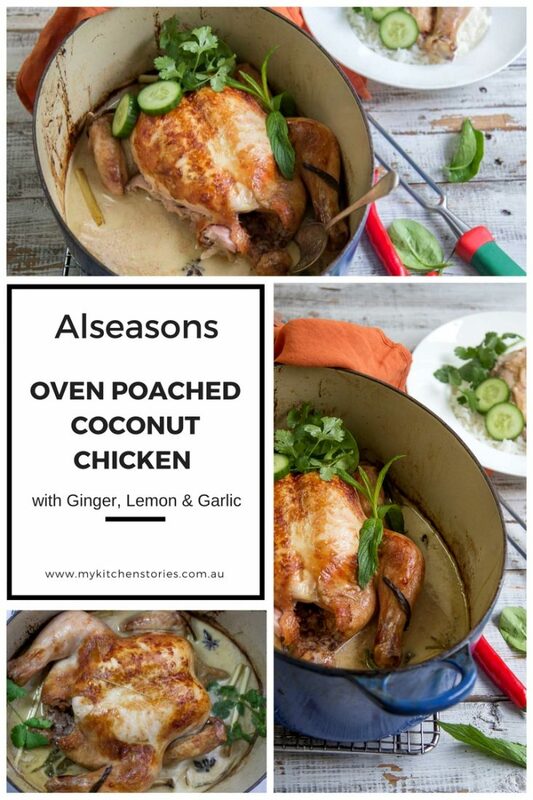 This makes a great share dish, dinner dish or BBQ centrepiece with salad or with rice for those dark wintery nights..
Set the oven to 180 C / 350 F Rub the chicken breast with olive oil. Heat the oven proof dish to high and put the chicken into the dish breast side down for 2-5 minutes or till well coloured. Bake for 1 hour and check if the juices run clear in the leg join. If not bake a further 20 minutes. The chicken should be golden and cooked all the way through. I bet the chicken must be very tender and juicy cooked in coconut milk. Awesome! Hi Angie. Yes it comes out very moist and delicious. Wow, I just decided on dinner tonight. This looks like a fabulous way to cook chicken. 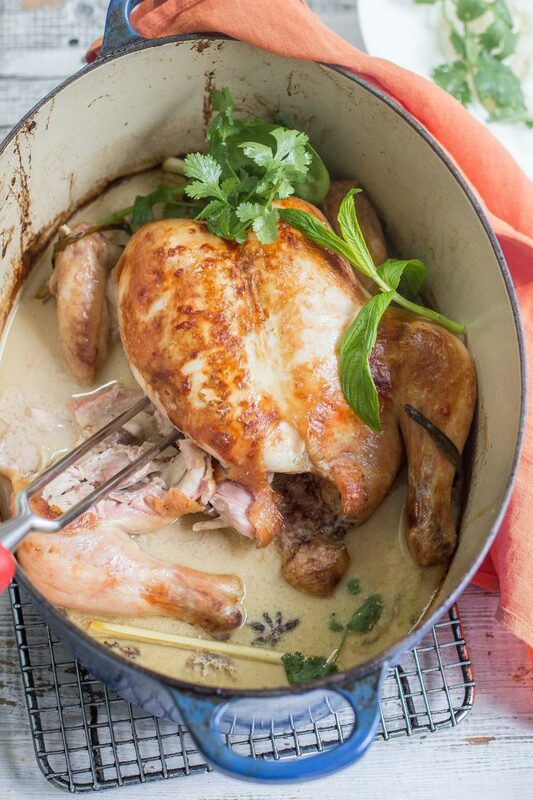 Jamie Oliver’s chicken cooked in milk is a favorite but this looks even more flavorful. Wow I’d love to know how you go ! Have to tell you that it has become a favorite in our house. Thank you. It is even delicious with just some coconut milk, a bit of curry sauce, some ginger slices. My husband wants to learn to cook it (a first) and even prefers it to sous vide. As you know I love your recipes. You are the life saver in our house and make me look very good when I rustle up your recipes to my friends for dinner parties and to my partner!